Honey is one of nature’s greatest gifts. As well as being a nutritious and delicious food, the golden syrup has incredible medicinal benefits. In fact, honey has a unique set of antibacterial, antiviral, anti-inflammatory, anti-fungal, antiseptic, digestive and antioxidant properties. Not all honeys are the same. One of the most medicinal honeys available is Manuka Honey, which is currently the only medical-grade honey on the market. Manuka honey comes from nectar collected by honeybees foraging on the manuka tree, which grows in New Zealand. It was traditionally used by the Maori people to treat wounds and burns. 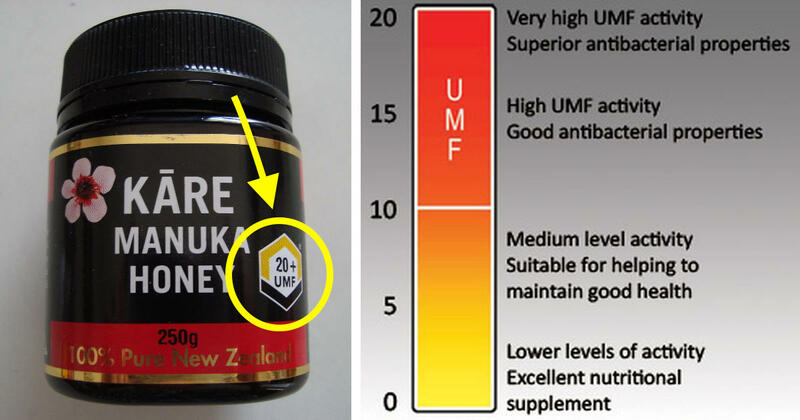 To be considered potent enough to be therapeutic, manuka honey needs a minimum rating of 10 UMF (unique manuka factor). Honey at or above that level is marketed as “UMF Manuka Honey” or “Active Manuka Honey” (1). Manuka honey is often used by doctors to kill antibiotic-resistant bacteria. “The unique [antibiotic] properties of honey lie in its ability to fight infection on multiple levels, making it more difficult for bacteria to develop resistance,” says Susan M. Meschwitz, Ph.D.
That is, it uses a combination of weapons, including hydrogen peroxide, acidity, osmotic effect, high sugar concentration and polyphenols — all of which actively kill bacterial cells, she explains. Manuka honey is also believed to stop bacteria from attaching to tissue at the molecular level (2). Researchers also say that honey has been shown to exhibit “broad-spectrum” antimicrobial activity, being able to act upon more than 80 species of pathogen (2), including E. coli, Staphylococcus aureus and Pseudomonas aeruginosa (3). Unlike antibiotics, the syrup has not been reported to cause development of resistant bacteria. Researcher are even trying to use honey alongside antibiotics to kill antibiotic-resistance bacteria with promising results. Manuka honey is a true medicinal food. Not only can it reduce high cholesterol, treat eye, ear, and sinus infections and treat gastrointestinal problems, it also has the following benefits. In patients with diabetes mellitus, studies showed that honey supplementation considerably reduced glycemic response after meal or showed lower rise in blood sugar than other sugars or sweeteners did (4). In addition, honey supplementation was shown to increase insulin concentrations in diabetic patients more than sucrose did. It’s safe to say that honey might be a much healthier sweetener than typical diabetic-targeted products. However,before taking honey to treat diabetes, you should always consult your doctor or nutritionist to make sure it’s appropriate for you. Honey has shown to reduce both acute and chronic inflammation. Although the mechanism for this anti-inflammatory action is not entirely understood but it’s believed to be due to it’s high antioxidant content (5). In fact, manuka honey has more antioxidants than any other variety of honey. These benefits can be experienced by both internal and external use of the honey and has proven to be very beneficial in the case of digestive disorders. Honey has remarkable anti-cancer benefits which both treat and prevent the disease. It diminishes tumours by inducing cell death and preventing the spread of cancerous cells. Also, honey prevents gene mutation and prevents free radical accumulation, which are both involved in the development of cancer. Manuka honey is expensive, but considering all the health benefits mentioned above, it’s a staple for any natural medicine practitioner. To ensure you’re getting a high quality product, always look for a label that reads “”UMF Manuka Honey” or “Active Manuka Honey”. The honey must be produced in New Zealand to qualify for these labels. 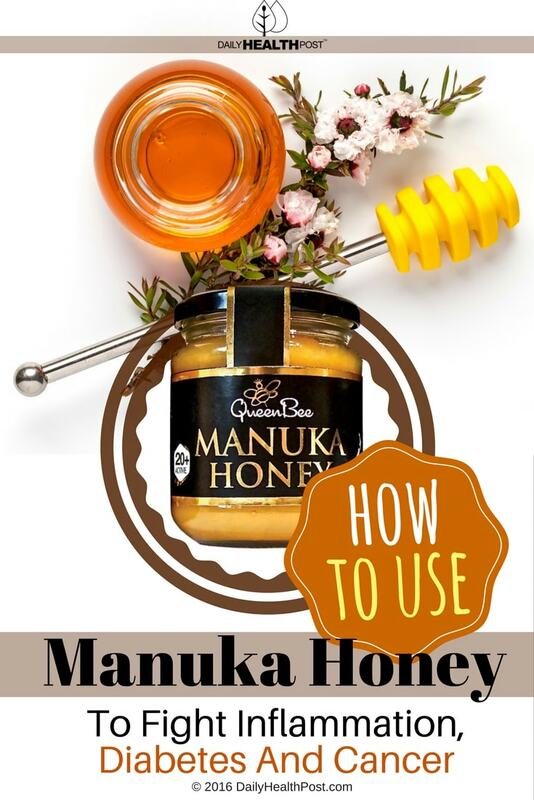 Similar to regular ones, manuka honey can be applied topically to the skin as a balm for skin infections, bites and cuts. If you have a sore throat or digestive problems, taking a spoonful orally can help.